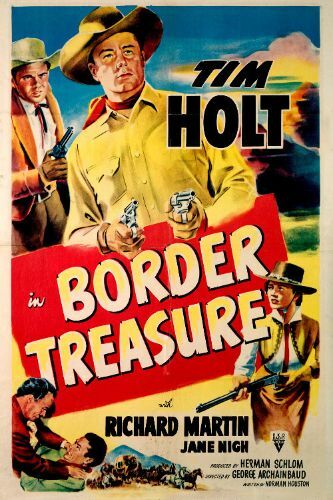 For a Tim Holt western, Border Treasure is surprisingly light on action scenes. The plot is the main consideration, as Ed Porter (Holt) and his saddle pal Chito Rafferty (Richard Martin) set about collecting money for an earthquake relief fund. The donations are stolen by the villains, whereupon Porter and Rafferty take chase. They nearly ride into an ambush, but are saved by Stella (Jane Nigh), the repentant girlfriend of one of the outlaws. Before the film's six reels have run their course, Our Heroes find themselves being accused of the robbery. Tim Holt fans won't believe that for a minute!